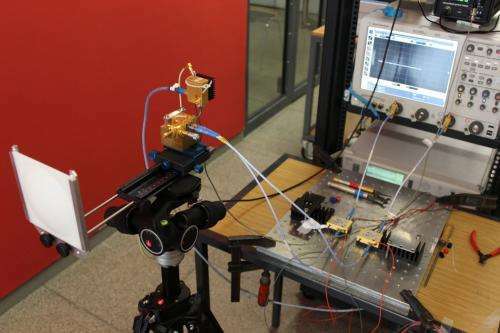 In their record experiment, 100 gigabits of data per second were transmitted at a frequency of 237.5 GHz over a distance of 20 m in the laboratory. In previous field experiments under the "Millilink" project funded by the BMBF, rates of 40 gigabits per second and transmission distances of more than 1 km were reached. For their latest world record, the scientists applied a photonic method to generate the radio signals at the transmitter. After radio transmission, fully integrated electronic circuits were used in the receiver. "Our project focused on integration of a broadband radio relay link into fiber-optical systems," Professor Ingmar Kallfass says. He coordinated the "Millilink" project under a shared professorship funded by the Fraunhofer Institute for Applied Solid State Physics (IAF) and the Karlsruhe Institute of Technology (KIT). Since early 2013, he has been conducting research at Stuttgart University. "For rural areas in particular, this technology represents an inexpensive and flexible alternative to optical fiber networks, whose extension can often not be justified from an economic point of view." Kallfass also sees applications for private homes: "At a data rate of 100 gigabits per second, it would be possible to transmit the contents of a blue-ray disk or of five DVDs between two devices by radio within two seconds only." "It is a major advantage of the photonic method that data streams from fiber-optical systems can directly be converted into high-frequency radio signals," Professor Jürg Leuthold says. He proposed the photonic extension that was realized in this project. The former head of the KIT Institute of Photonics and Quantum Electronics (IPQ) is now affiliated with ETH Zurich. "This advantage makes the integration of radio relay links of high bit rates into optical fiber networks easier and more flexible." In contrast to a purely electronic transmitter, no intermediate electronic circuit is needed. "Due to the large bandwidth and the good linearity of the photon mixer, the method is excellently suited for transmission of advanced modulation formats with multiple amplitude and phase states. This will be a necessity in future fiber-optical systems," Leuthold adds. Reception of radio signals is based on electronic circuits. In the experiment, a semiconductor chip was employed that was produced by the Fraunhofer Institute of Applied Solid State Physics (IAF) within the framework of the "Millilink" project. The semiconductor technology is based on high-electron-mobility transistors (HEMT) enabling the fabrication of active, broadband receivers for the frequency range between 200 and 280 GHz. The integrated circuits have a chip size of a few square millimeters only. The receiver chip can also cope with advanced modulation formats. As a result, the radio link can be integrated into modern optical fiber networks in a bit-transparent way. Already in May this year the team succeeded in transmitting a data rate of 40 gigabits per second over a long distance in the laboratory using a purely electronic system. In addition, data were transmitted successfully over a distance of one kilometer from one high-riser to another in the Karlsruhe City center. "The long transmission distances in "Millilink" were reached with conventional antennas that may be replaced by fully integrated miniaturized antenna designs in future compact systems for indoor use," says Professor Thomas Zwick, Head of the KIT Institut für Hochfrequenztechnik und Elektronik (Institute of High-Frequency Technology and Electronics). The present data rate can be still increased. "By employing optical and electrical multiplexing techniques, i.e., by simultaneously transmitting multiple data streams, and by using multiple transmitting and receiving antennas, the data rate could be multiplied," says Swen König from the KIT Institute of Photonics and Quantum Electronics (IPQ), who conceived and conducted the recent world-record experiment. "Hence, radio systems having a data rate of 1 terabit per second appear to be feasible. In the experiments, latest photonic and electronic technologies were combined: First, the radio signals are generated by means of an optical method…. This seems to be a great improvement in radio communication technology, while in theoretical realm; there is still no conventional explanation how the radio waves could propagate of via empty vacuum space, maybe this unconventional view could help to visualize ….